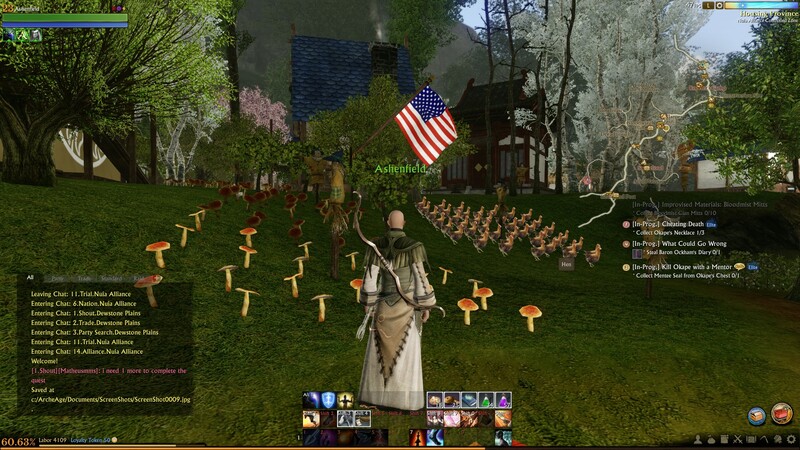 No offence to my American friends here...but really...do we need this kind of patriotic circle jerk in a fantasy game? As westernized as AA is for us, you have to remember it's still an asian game first and they're not known for their deep immersion. But, I agree that seeing that kind of stuff in game really blows as immersion is a big deal for me. Certain things i can forgive for the sake of convenience or complexity, and I generally turn off all public chat, but this was just awful to see. It's really no better than if I saw an Nvidia or McDonalds ad on the side of a building. They are just so far out of context in world they are trying to present that they are laughable and distracting. If it were in a world where an american flag could feasibly exist I wouldn't have looked twice, I have no fundamental opposition to the American flag. Seems to me it's just needless outright pandering to the western audience. Every great game has some faults, albeit this one could easily have been avoided. Canadien Dander , isnt that used as a pesticide in 3rd world counties? They won't take it so we send it to Detroit. Farm Sim 17 is out! What Is Illusion-Be-Gone in Grim Dawn?